During Day 3 of ProMat, the focus turned to the future of supply chain. At the main stage AI was a major topic of discussion as the 2019 MHI Annual Industry Report was unveiled. ProMat 2019’s final keynote Marcus Lemonis hit the stage to share his secrets to business success. He even got a chance to walk the show floor! In the evening, the MHI Industry Night bash kicked off with live music and hors d’oevres. 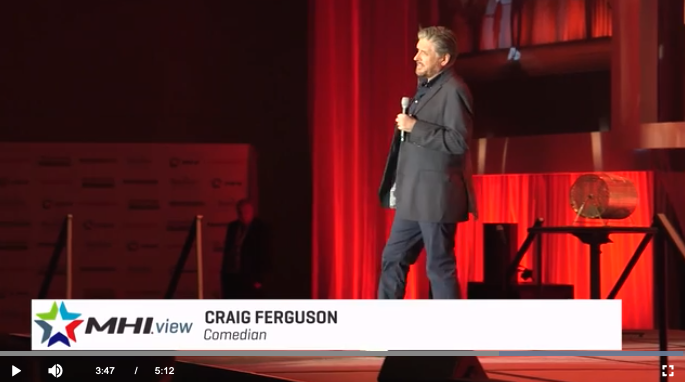 Comedian Craig Ferguson warmed up the crowd followed by the presentation of three MHI Innovation Awards and two MHI Young Professionals Awards. View the full video to learn more. ProMat is where manufacturing and supply chain professionals come to find their supply chain WOW – that trend or technology that will take their supply chain to the next level of success. This event is the one show where attendees will see in person, in action the best solutions and innovations the industry has to offer and meet the leading providers face-to-face.